This solution enables an IT department to achieve the above with little to no infrastructure to manage, with a process that's easy and simple. When initially deploying new Windows devices, Windows Autopilot leverages the OEM-optimized version of Windows 10 that is preinstalled on the device, saving organizations the effort of having to maintain custom images as well as drivers for every model of device being used. Instead of re-imaging the device, that existing Windows 10 installation can be transformed into a “business-ready” state, applying settings and policies, installing apps, and even changing the edition of Windows 10 being used (e.g. from Windows 10 Pro to Windows 10 Enterprise, to support advanced features). Once deployed, Windows 10 devices can be managed by tools such as Microsoft Intune, Windows Update for Business, System Center Configuration Manager, and other similar tools. 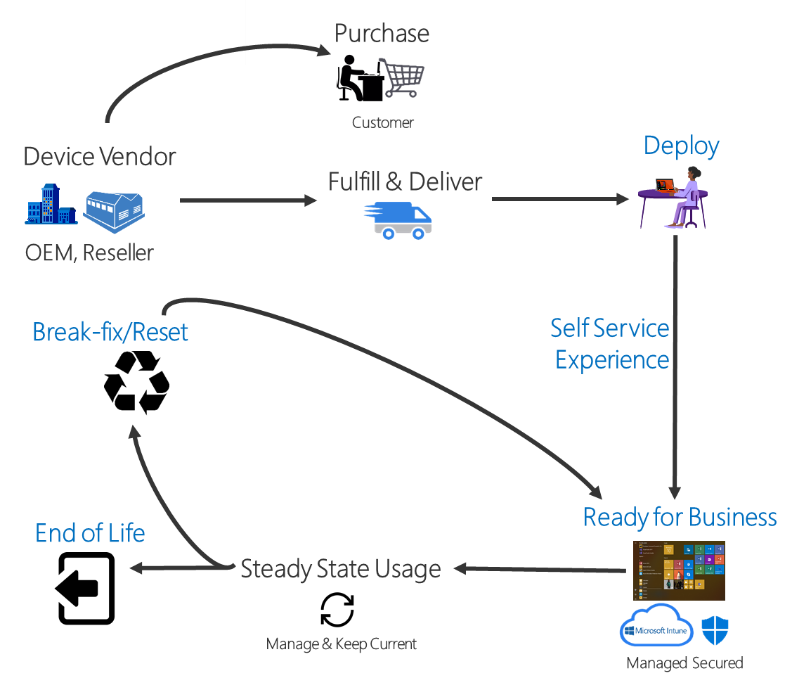 Windows Autopilot can help with device re-purposing scenarios, leveraging Windows Autopilot Reset to quickly prepare a device for a new user, as well as in break/fix scenarios to enable a device to quickly be brought back to a business-ready state. Traditionally, IT pros spend a lot of time building and customizing images that will later be deployed to devices. Windows Autopilot introduces a new approach. From the user's perspective, it only takes a few simple operations to make their device ready to use. From the IT pro's perspective, the only interaction required from the end user is to connect to a network and to verify their credentials. Everything past that is automated. See Windows Autopilot requirements for detailed information on configuration, network, and licensing requirements. Windows Autopilot enables you to pre-register devices to your organization so that they will be fully configured with no additional intervention required by the user. Automatically join devices to Azure Active Directory (Azure AD) or Active Directory (via Hybrid Azure AD Join). See Introduction to device management in Azure Active Directory for more information about the differences between these two join options. Auto-enroll devices into MDM services, such as Microsoft Intune (Requires an Azure AD Premium subscription). Restrict the Administrator account creation. Create and auto-assign devices to configuration groups based on a device's profile. See Windows Autopilot scenarios for more information about scenarios for using Windows Autopilot.